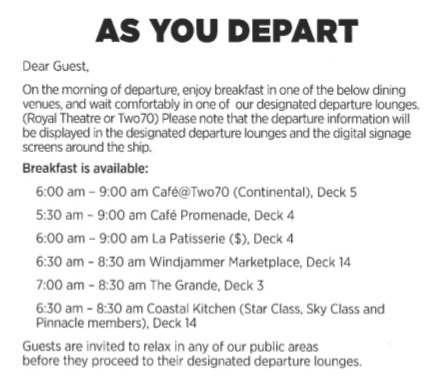 breakfast available on disembark day? Will there be food available on the day of disembark? Yes, a full breakfast is available but it is over earlier than the other days...I think 8:30 but that may depend on the ship. The hours will be in the cruise compass. Click on cruise compass in the main menu above and look for your ship to get an idea for the specific hours and venues. Also worth noting, the breakfast areas tend to be very crowded and hectic on disembarkation day. Lots of people with luggage in a rush to eat and get off the ship! I second @KLAconQueso 's post...its a madhouse in there. If you think its normally busy in the mornings, you don't want to be there the last one!...Line ups for everything and finding a table is a challenge to say the least. I just do coffee on disembarkation day and skip the madness. We usually do a quick swing by Park Cafe or Cafe Promenade - we generally have time to kill in the airport anyway so it almost becomes easier to just settle in for breakfast there. Main Dinning Room on disembarkation day for the win! I agree that this is the most convenient/sane option. Although to be honest, it's been years since I've done breakfast on disembarkation morning as it's usually just not worth the hassle with everything else going on, so we usually skip it and grab something off ship instead. The exception has been Disney as they have fixed breakfast seating in the morning and Holland America as they have room service breakfast on disembarkation morning. We cheated on Princess with room service breakfast as we disembarked a day early, so we were able to order it then, too. I send my husband to WJ on disembarkment day. I serve him in bed for two days to get him ready. I serve him in bed for two days to get him ready. I HATE the hectiness of the WJ on D-day though. Might give main dining room a go next time around. I agree with this, most people go to WJ and it is a madhouse, we were at the MDR on Freedom and it was pretty much dead. We had the 2 waiters there the whole time and was much easier then trying to fight people. We also left everything in our room so we could eat and just went back to the room to grab everything before we left. We didn't have anywhere important to be so we kind just took our time and tried not to rush leaving lol. Now only if it was as easy to get off the ship as it was to get on lol. How is CK on disembarcation morning? On Harmony we strolled in around 8am and it was great! Calm, in and out in about 45min. No one rushed you. 100% beats the WJ. Thank you. First RCCL cruise in 20 years. Trying to get everything figured out so I can hit the ground running. We love CK. We try to eat in there whenever possible. Service is always great, but the calm environment and good quality of food is what we love most. And if you have breakfast there you MUST try the French toast! It is so good!! Thank you. I will try that. I love French toast. When it is made right it is like bread pudding on a plate. 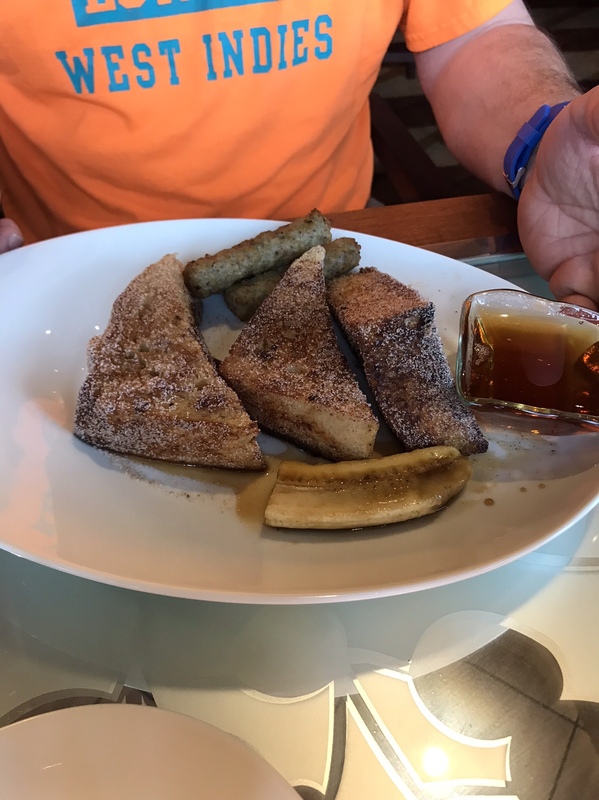 If I am served French toast the consistency of bread pudding, it will immediately be sent back to be properly cooked. French toast should be firm (but not dry), bread pudding should be soft (but not soggy). Lol. Obviously good french toast is very subjective. That French toast looks a lot like what we had on Freedom just the other week, and your description matches up, too. I wonder if that’s the standard recipe fleet-wide now? Only difference I can see is that it looks like the one in the photo might have a cup of real maple syrup instead of that corn syrup-based junk euphemistically labeled “breakfast syrup”.